Any farming or livestock operation has a need for troughs and feeders. 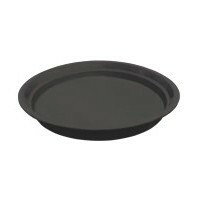 Bushmans range of agricultural products includes poly water troughs, and feeders, and cup and saucer tanks. Some of the applications of the Bushman’s water troughs and hay feeders on farms are: sheep and cattle watering through water troughs, sheep and cattle feeding, horse feeding and watering which utilises a hay feeder and a horse trough, as well as other animals including pigs, alpacas and goats. Our livestock water trough and feeding trough are purposely designed to cater to different animals to ensure that our animal troughs can help farmers achieve operational efficiency in their work. Which Farmers should use Water Troughs & Feeders? Any farmer running livestock will have use for a Bushman’s plastic water trough or galvanised water trough and will be able to combine these products with a feeding trough to develop their stock and take full advantage of storage capabilities and rest easy knowing the product comes from a reliable Australian source. Our cattle troughs can be used on small farms to large scale cattle stations. Hobby farmers running horses can make use of our horse trough and hay feeder to keep their horses well fed and happy as well or they can be used for any other animals you may have. Additionally, farmers in high rainfall intensive farming areas through to farmers and graziers in the arid station country will be able to benefit from the use of water troughs and feeders on farms. Cost effective way to provide water to cattle, sheep, horses and other farm livestock. Water in a trough is fresh and does not become contaminated, while some dam water can – especially in very dry conditions. Livestock thrive on clean water. Stock feeders are easy to maintain but they do need to be regularly cleaned out to ensure that the feed the cow or sheep eat is not contaminated. Water troughs are more critical and often are not checked or seen as often as feeders. The things to check include. Often the thing that goes wrong is the float valve that regulates the water going into the trough. The valve can stick and cause an overflow or cause the trough to be empty. It can at times be damaged by livestock. 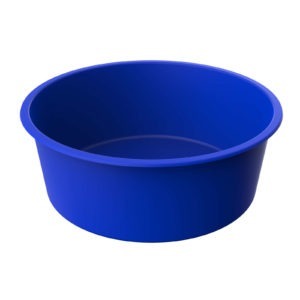 For our customers, it is essential that these products stay in top condition despite the tough Australian climate – all our feed troughs, cup and saucer tanks and other agricultural products have stood the test of time and are built to last. For the efficient running of livestock, the use of water troughs and feeders have become an essential part of the gaining productivity from better grazing management and less distances for stock to travel to water. 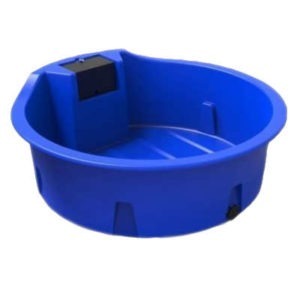 Our feed troughs and cup and saucer tanks range have a product that is suitable for cattle, sheep, horses and other livestock. To find out about the right product call Bushmans on 1800 287 462. 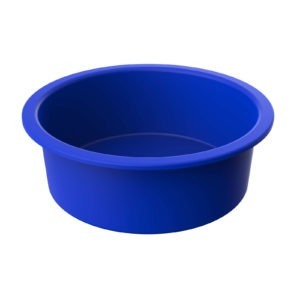 Cup and saucer tanks are an ideal product where water is needed in remote locations and this product provides a simple and effective source water that can be moved around the property. At Bushmans we are continuously expanding our product range. 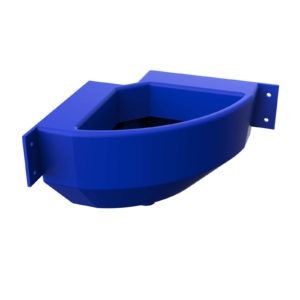 The recent introduction of the TRW130 600 litre water trough is a trough with a fully inbuilt float valve system that is easy to install and move around. The major advantage of a poly feed trough is that they are very easy to install, strong and robust as well as being soft on the legs of cattle.